If your dog is constantly licking his paws or chewing his feet, there are several possible reasons for it. At East Valley Animal Hospital, we’ve seen our share dogs who persistently lick their paws and have helped to determine what might be troubling them. Let’s look at some of the potential causes. When we look at why dogs lick their paws, our first concern is whether the dog has injured his foot. He may also chew his foot when he has another problem such as hip dysplasia or arthritis. Our experienced veterinarians can determine the root cause of the pain and prescribe the appropriate treatment to make your best friend comfortable again. It’s hard to imagine that an allergy might manifest itself as paw licking, but that can happen. Your dog may be licking his paw because of contact allergies, or even food allergies. Food allergies can express themselves as skin conditions which can cause your dog to gnaw at his very itchy skin. With careful testing, we can diagnose food allergies and put your dog on a hypoallergenic diet with a novel protein source to relieve his suffering. 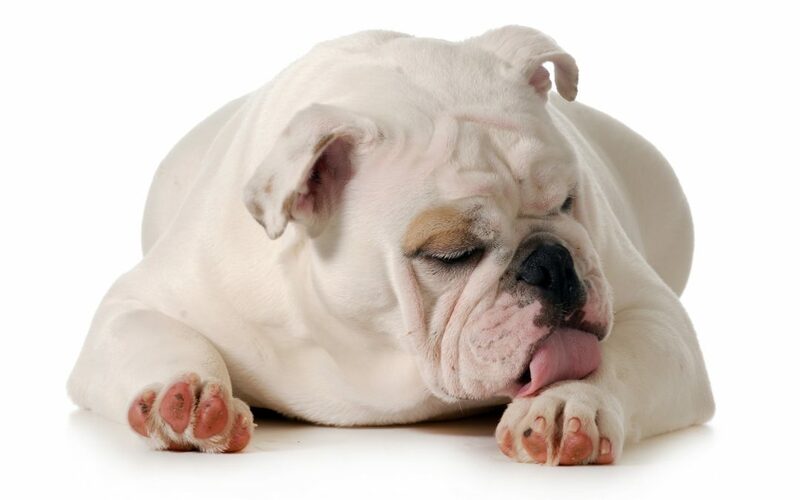 Like people, dogs can suffer from a variety of skin conditions which can cause them to lick or chew their paws. Some may be due to allergies, but there are some skin conditions which could require further medication. These conditions can be diagnosed upon careful examination. Although seeing fleas can be uncommon in our climate, your dog could still be suffering from fleas, mites, ticks, or other external parasites, especially if you have taken him to higher elevations such as the mountains. Even if you don’t see a flea, you can tell if your dog is infested by the black grains of “sand” that turn red when they get wet. Other external parasites such as mites require skin scrapings to detect. We can make sure your pup is clear of external parasites that might be causing his discomfort. Finally, it is possible for dogs to like their paws because of nervousness, boredom, or anxiety. We can help to treat your dog for obsessive-compulsive disorder that can cause him to chew and lick at his paws. For more information about why your dog many be licking his paws, please contact us at East Valley Animal Hospital. We can help your dog lick whatever may be ailing him!